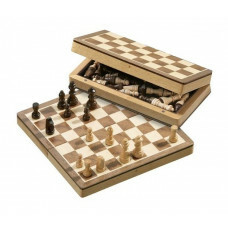 Never go anywhere without a Travel Chess Set! Nice to have both short and long trips. Easiest and fastest to find opponents wherever you are in the world. 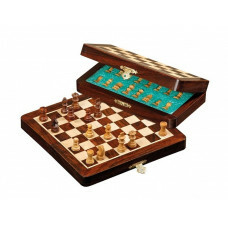 Below you can find many affordable and exclusive travel chess in wood, magnetic or not, folding or not, of different woods weighing no more than half a kilo. 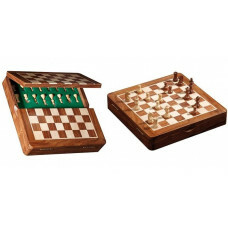 Chess set, small Medium, AN 2705 / Book design with magnetic lock, made of poplar natural stained. Playing field with inlays of maple and walnut, matt-finished.. 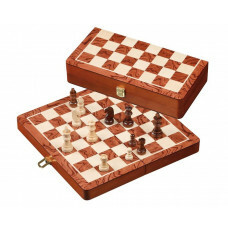 Chess set, small Medium, AN 2708 / Cassette design with clasps, made of beech natural stained. Playing field with inlays of beech and walnut, matt-finished. Fi.. 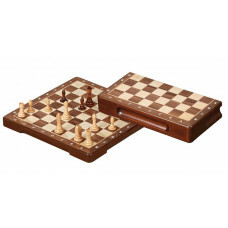 Stylish chess set, AN 2717 / A small Medium chess set made of poplar, reddish brown stained, with clasps. Playing field with inlays of rosewood and maple. Fiel.. 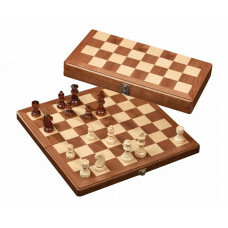 Exclusive chess set, AN 2712 / An affordable small Medium chess set made of poplar with clasps. Magnetic board with decorative lines and inlays of sapele and m.. 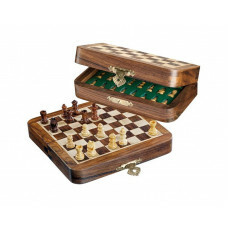 Stylish chess set, AN 2625 / A small chess set made of poplar with clasps. Playing field with inlays of walnut and maple. Field size 33 mm. Design Staunton che.. 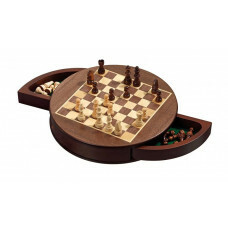 Exclusive travel chess set, AN 2729 / Magnetic round board with 2 drawer, made of sheesham with inlays of boxwood and maple. Field size 19 mm. Design Staunton .. 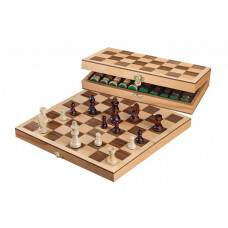 Exclusive travel chess set, AN 2733 / Magnetic board with magnetic lock, made of sheesham with inlays of boxwood and maple. Field size 25 mm. Design Staunton c.. 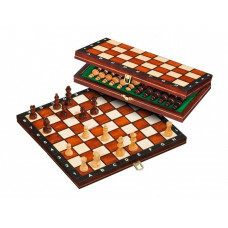 Chess set with Chess-notation, AN 2701 / Magnetic travel chess set in cassette design with clasps, made of limewood brown stained, printed playing field with c.. 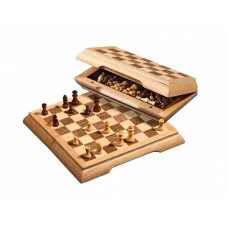 Chess set with Chess-notation, AN 2702 / Travel chess set in cassette design with clasps, made of limewood brown stained, printed playing field with chess-nota.. 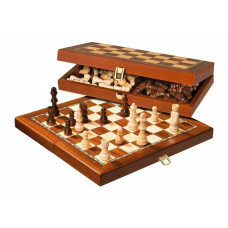 Chess set Small with Chess-notation, AN 2710 / Travel chess set, Cassette design with clasps, made of poplar, reddish brown stained, with inlays of walnut and.. 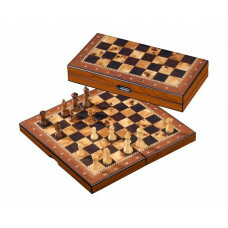 Chess set Small with Chess-notation, AN 2711 / Travel chess set, Cassette design with clasps, made of poplar, reddish brown stained, with inlays of walnut and.. 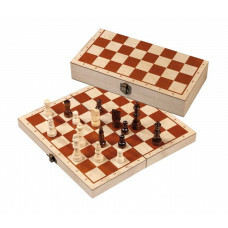 Chess set, Small with Chessnotation, AN 2621 / Travel chess set in cassette design with magnetic lock, made of MDF brown stained, with ornamental line, printed.. Chess set, Small with Chessnotation, AN 2608 / Travel chess set, Cassette with clasps, made of birch natural stained, printed playing field with chess-notation.. Chess set, Small and Beautiful, AN 2724 / Travel chess set, Cassette with magnetic lock, made of basswood brown stained, with inlays of walnut and maple, matt-.. 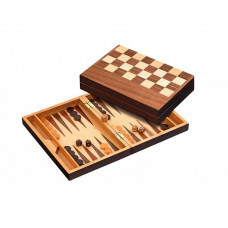 Chess set, Small practically, AN 2723 / Travel chess set, Magnetic board with magnetic lock, made of beech with inlays of walnut and beech, matt-finished, Fiel.. 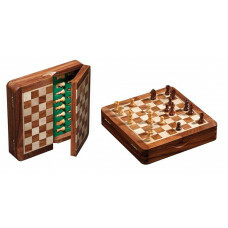 Exclusive travel chess set, AN 2732 / Magnetic board with magnetic lock, made of sheesham with inlays of boxwood and maple. Field size 19 mm. Design Staunton c.. 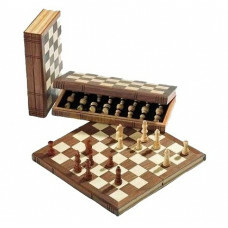 Exclusive travel chess set, AN 2721 / Travel chess set perfect for the traveler. Magnetic board made of sheesham with inlays of sheesham and maple. Field size .. 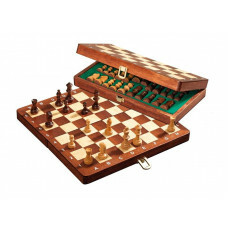 Exclusive travel chess set, AN 2718 / Magnetic board with drawer, made of sheesham with inlays of boxwood and maple. Field size 13 mm. Design Staunton chess pi.. Chess set, travel and affordable, AN 2716 / Beautiful chess set perfect to take on the trip. Magnetic board made of beech, with inlays of walnut and beech. 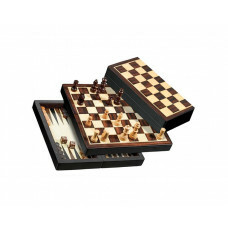 Fie..
Mini, travel and exclusive Chess Set, AN 2719 / Convenient, beautiful chess set for the traveler. Magnetic board made of sheesham wood. 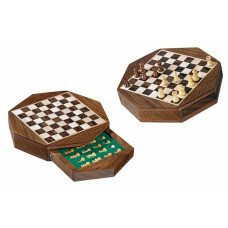 Inlays of sheesham and ..
Foldable Medium Chess Set, AN 2706 / Portable chess set with chess notation. 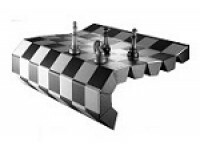 Chess board foil-clad with printed playing field, size 30 mm. 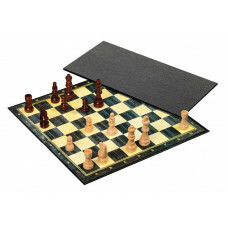 Staunton design ches..
Foldable Small Chess Set in MDF, AN 2709 / Portable chess set easy to bring. Chess board of MDF with printed playing field, size 27 mm. Staunton design chesspi.. 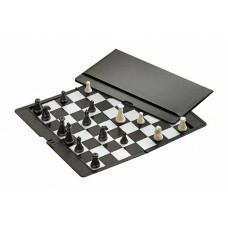 Chess Traveling, AN 6531 / Mini magnetic travel chess set in cassette design. Made of plastic, playing field in black and white with plastic chessmen in black ..
Backgammon + Chess + Dam, AN 2801 / Travel combo game set in roll up design. Made of light brown synthetic leather with two playing fields. 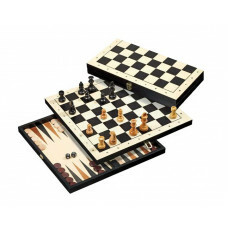 Chess playing field..
Backgammon + Chess + Dam, AN 2507 / Mini travel combo set in cassette design with magnetic lock. 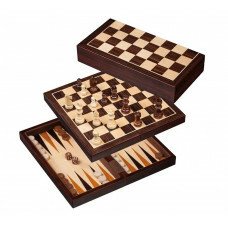 Made of birch and maple, brown stained with magnetic playing f..
Backgammon + Chess + Dam, AN 2508 / Travel combo set in cassette design with magnetic lock. Made of hevea-wood and maple, reddish brown stained. 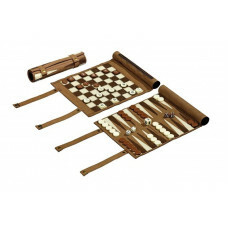 Both Backgammo..
Backgammon + Chess + Dam, AN 2511 / Travel combo game set in cassette design with clasp. Made of popplar and maple, black stained. 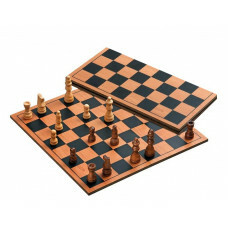 Chess playing field with che..
Backgammon + Chess + Dam, AN 2516 / Nice travel combo set in cassette design with magnetic lock. Chess playing field with ornamental line. Made of birch and ma..